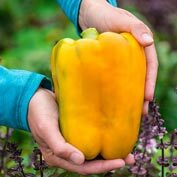 Mega Gold Hybrid Sweet Pepper | Gurney's Seed & Nursery Co.
A BIG Improvement Over Super Heavyweight! Mega-sized, up to 8-in. 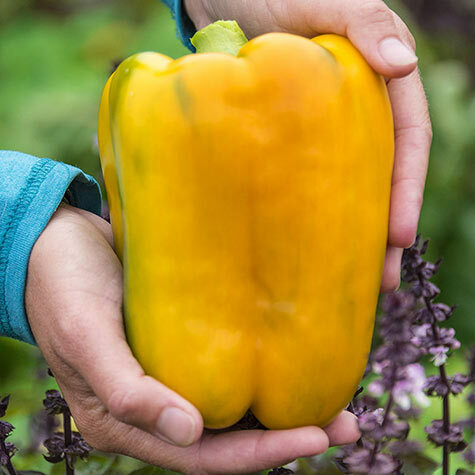 bells ripen from glossy green to golden with a flavor even sweeter than red bell peppers. We were looking for a pepper to replace Super Heavyweight, and we found it! In our trials Mega Gold out yielded, out-sized and out-flavored Super Heavyweight. 80 DAYS. Spacing: 12 - 24 inches apart. Depth: Plant seeds 1/4 inch deep. Plants at the same depth as in the pot. Spread: 24 - 28 inches. Foliage: Glossy green, typical of peppers. Fruit: Large brilliant gold bells ripen from green to gold, 8 inch long fruit. 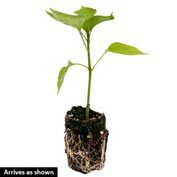 Germination: 10 - 15 days at 70 - 95 degrees F.
Soil Requirements: Well-drained, light, moderately fertile soil, high in organic matter. Seed Count: 10 seeds per packet. 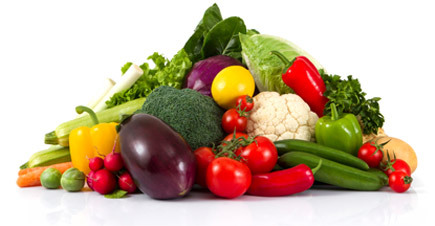 Comments: Mega-sized, up to 8 inch bells ripen from glossy green to golden with a flavor even sweeter than red bell peppers. We were looking for a pepper to replace Super Heavyweight, and we found it! In our trials Mega Gold Hybrid out yielded, out-sized and out-flavored Super Heavyweight.